Please use the Tabs above to navigate to the information you require. 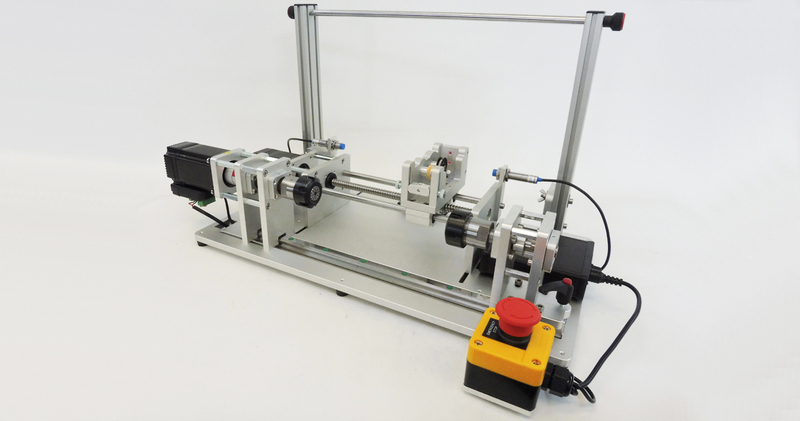 The Picture above shows the 200mm Coil Winding Machine fitted with optional Limit/Homing Switches and Emergency Stop Button. All machines from August 2017 are now fitted with Closed Loop motors on both feeder and bobbin. This increases the torque, accuracy, speed and no loosing steps. In the picture above you can see what you get when unpacked. Just bolt the bobbin motor onto the frame and plug in. Then attach uprights and bar to the back of the machine. You are now ready to wind ! 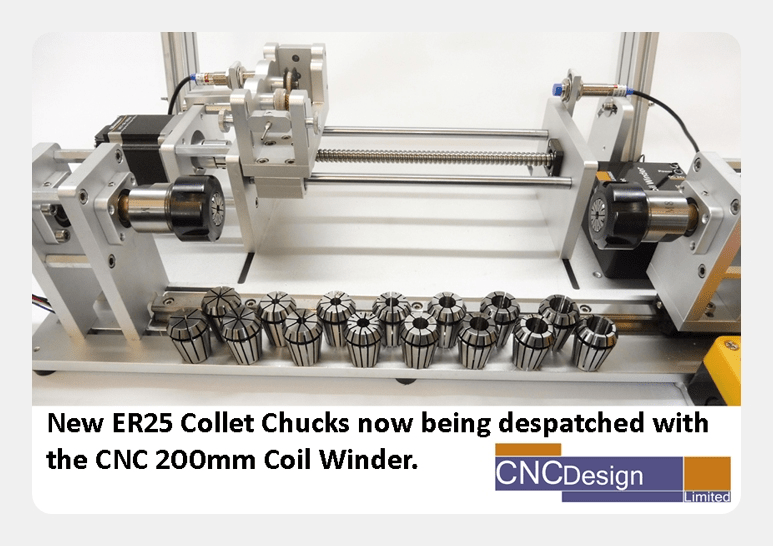 All 200mm Coil Winders are now supplied with ER25 Collet Chucks rather than drill chucks. 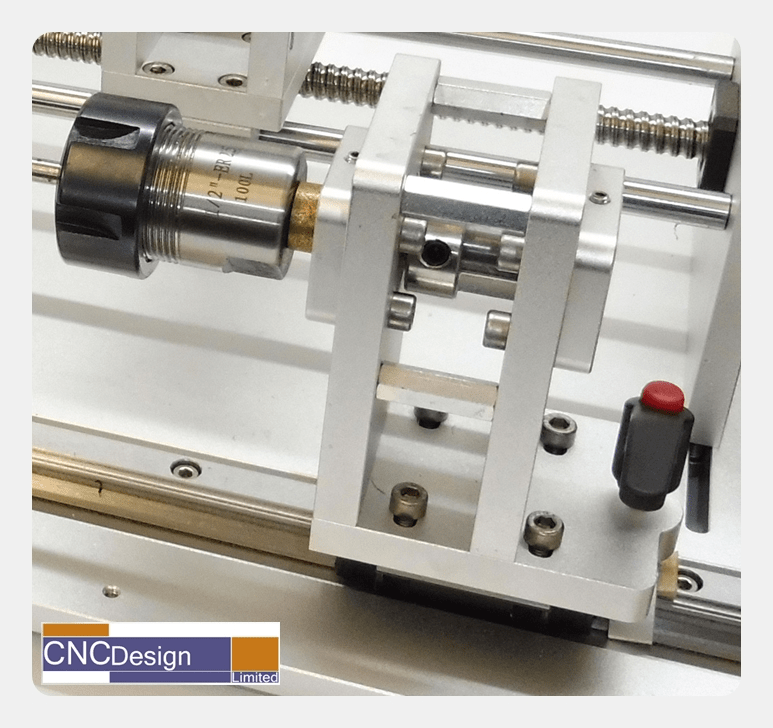 The main reason is to reduce run out and also you can use ER25 collets will allow a larger clamping diameter from 1mm – 16mm We will be supplying the machine with two collets which you can choose the size of and also extra sets of other sizes if needed. 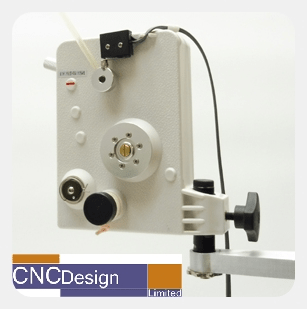 Our latest Desktop CNC 200MM Coil Winding machine is ideal for anyone who needs to produce small quantity runs of coils or custom one-off coils. 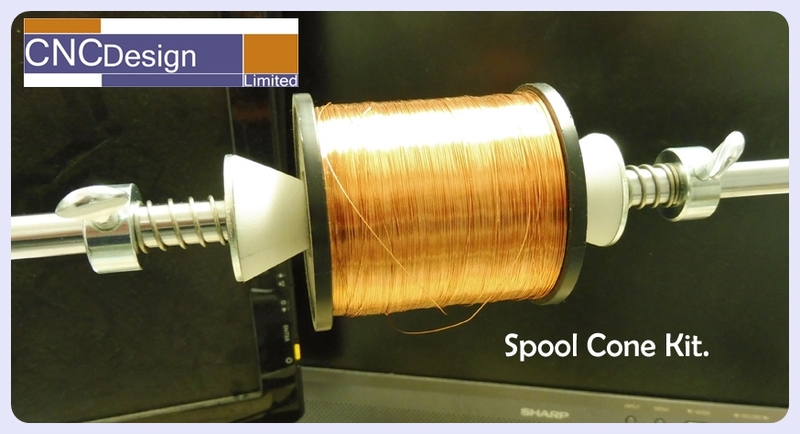 A vast range of different coils can be wound for electronic projects. 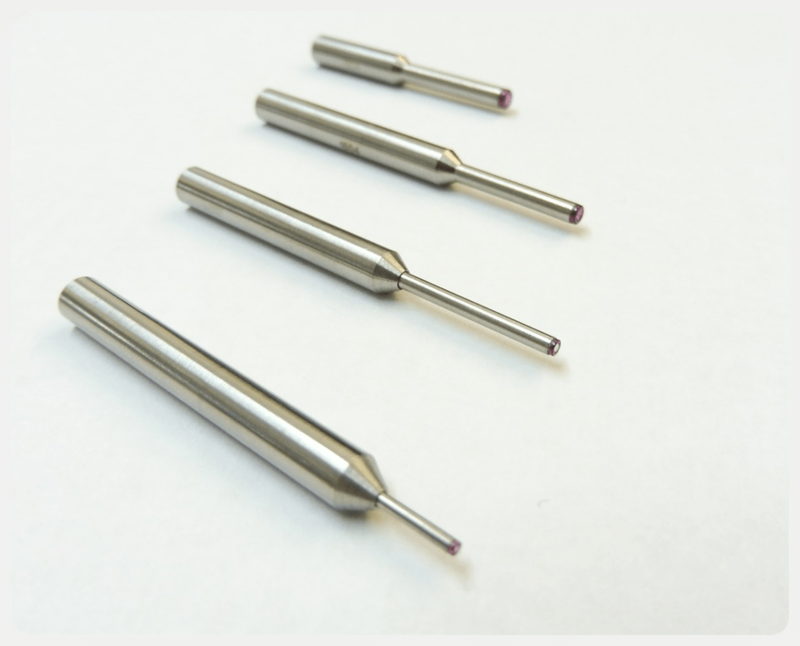 All of the parts of the machine are now milled by a 3rd party company and these parts come with a really attractive finish, as well as oxidisation treatment. High grade C7 ballscrews are used along with precision bearings combined with anti-backlash couplers on each axis. The wire feeder arm is now all aluminium along with double ceramic eyelets and porcelain guide wheel. The nozzle holder now accommodates the stainless steel ruby nozzles as used on commercial machines. Firmware can be upgraded over the USB port, and all Software/Firmware is free. 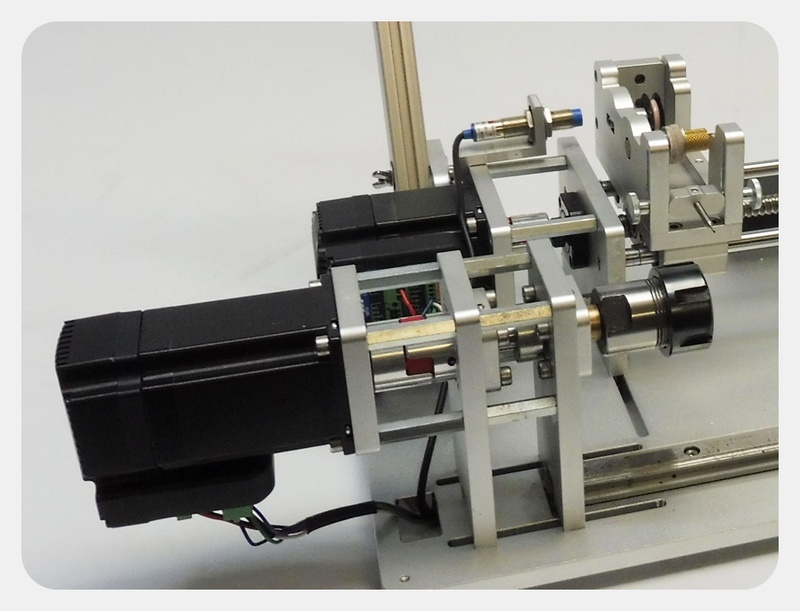 Repeatability along the 200mm length with a combination of C7 grade ballscrew and linear round bearings, in increments of 0.1mm is 75% or more per ballscrew turn, based on a 4mm pitch. 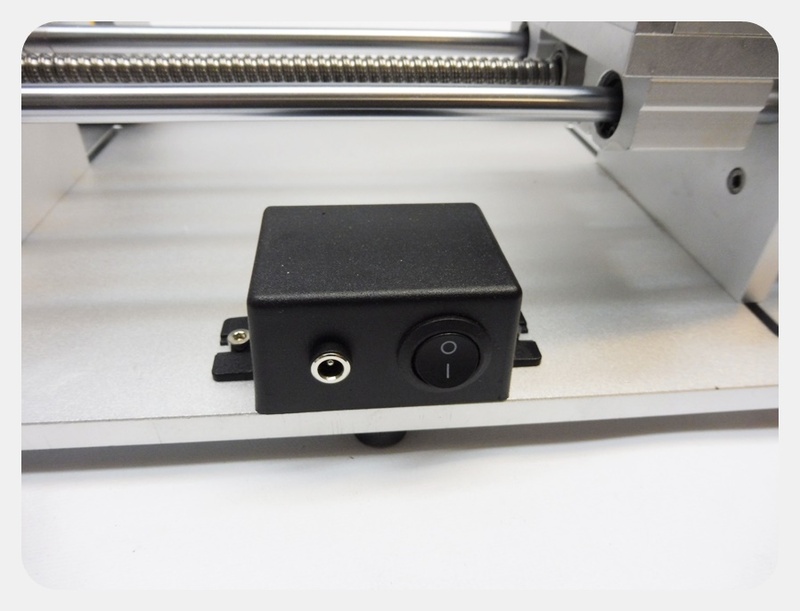 C5 ballscrew and low profile rail upgrade kits are available at an extra cost to bring repeatability up when using very small wire with very small movements. 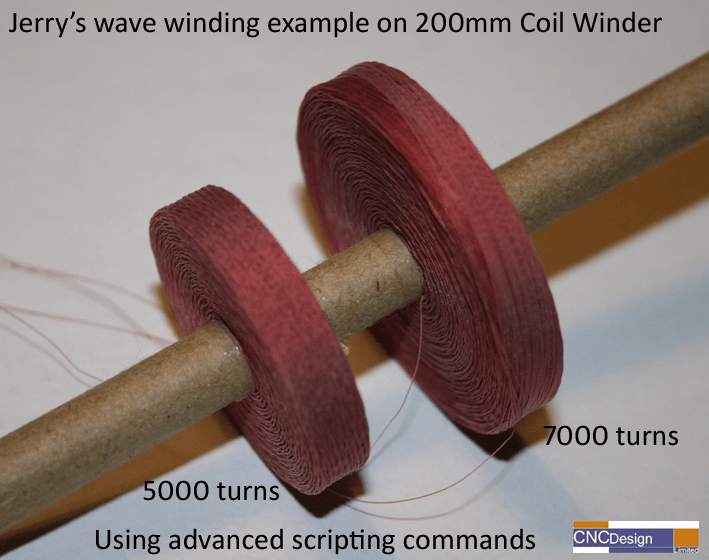 This requirement is more for people using the Absolute Scripting engine with thousands of small movements and winding coils such as LVDT but not generally needed for typical coils. Bobbin frame and feeder frame are both on sliding grooves of the base plate and can be adjusted. 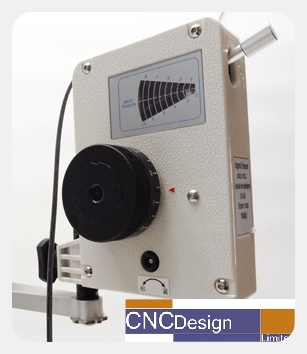 Manual speed controller that allows variable speed via a external dial on both bobbin and feeder arms, which allows for calibration and finding suitable winding speed. 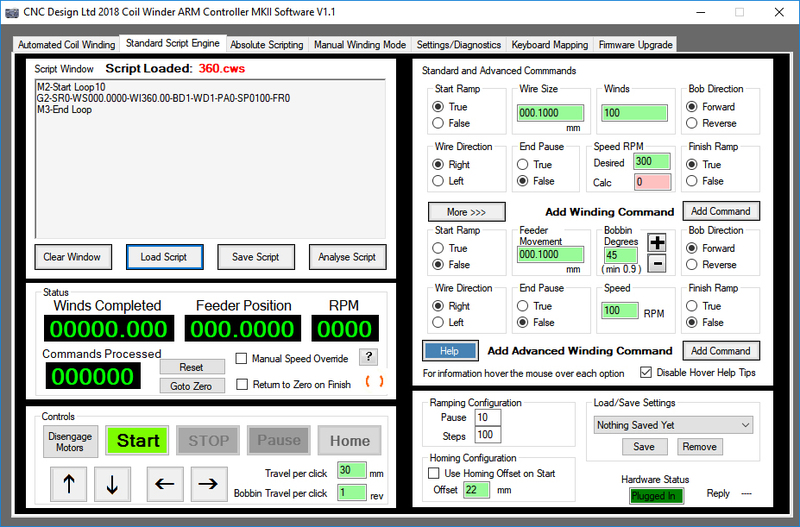 Free Firmware upgrades and Free Windows Software. Basically it should cover most tasks for small business/hobby needs. Please note that this machine is not designed to be a commercial machine that can be ran in a production environment 24/7. This is designed for prototyping and small batch runs and hence the low price. Also this machine is still in development, so please expect software, firmware and hardware upgrades as we strive to improve it. While the software and firmware upgrades will remain free, any hardware changes will be an additional charge if you choose to upgrade your machine. All machines from August 2017 are now fitted with a DC Power Box. This change prevents any damage to the Controller board by isolating the 24v line. 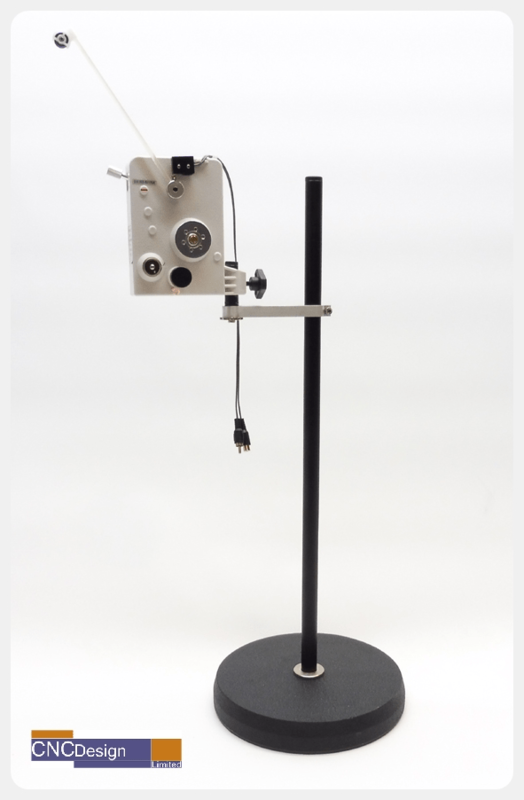 The Machine runs on DC power of 24 volts volts and is supplied with a 24V 6amp power supply, as well as a UK mains lead and USB cable. This machine is sturdy with no flex or wobble even at high speeds. It is constructed from aluminium 10mm thick plates all around. 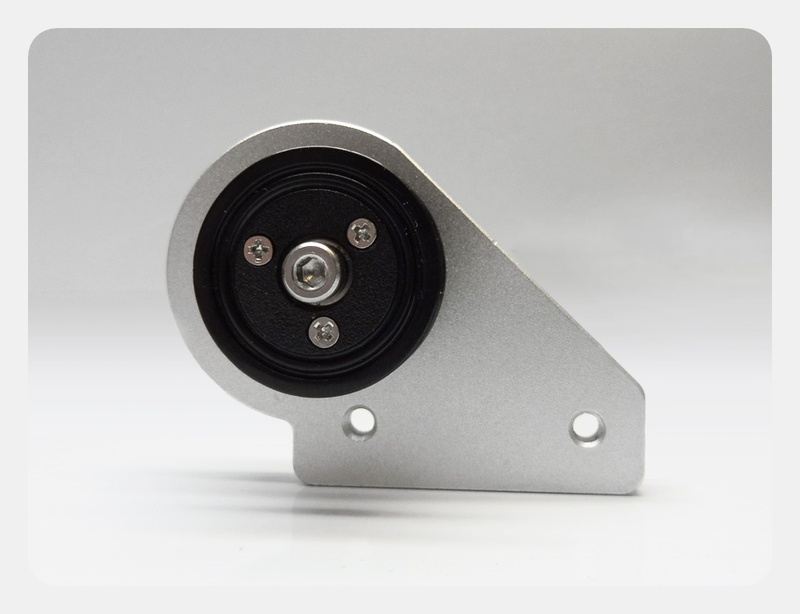 It is topped with high quality linear bearings and solid rails. This machine is designed to get the job done. We could have chosen a cheaper construction method such as rigid plastic and low cost bars, but what’s the point! C5 Ballscrew and low profiles rails. After doing a deal with a company who makes ground C5 ballscrews, we are now able to offer the C5 ballscrew and low profile rail upgrade kits available at an extra cost to bring repeatability up when using very small wire with very small movements. We have created a page with more information showing the difference between C7 and C5 ballscrews. The software and electronics have already been designed to allow inductive limit switches and a emergency stop button via the AUX1 socket that is already on the controller. This will allow the limit switches to be used for homing offset and also give a nice big stop button to press, rather than using the software if something looks like it is going wrong! Please find a video below showing the Limit Switches in action. The machine comes with a 10mm top bar that allows small spools to be mounted and also used as a guide for vertically mounted spools. 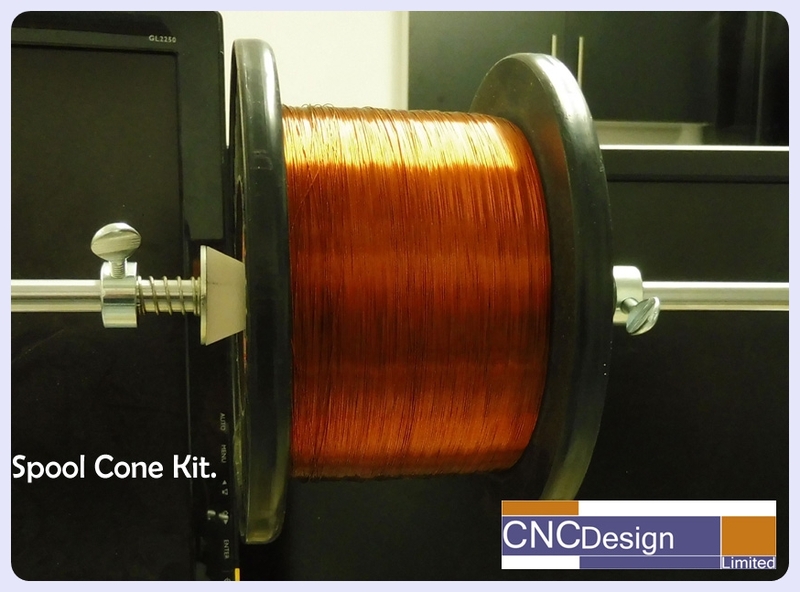 With the Spool Cone Kit it allows bigger spools to be mounted. Inside the cones it has needle bearings for smoother running. The machine comes with a very simple felt wire tension system to keep the price down. 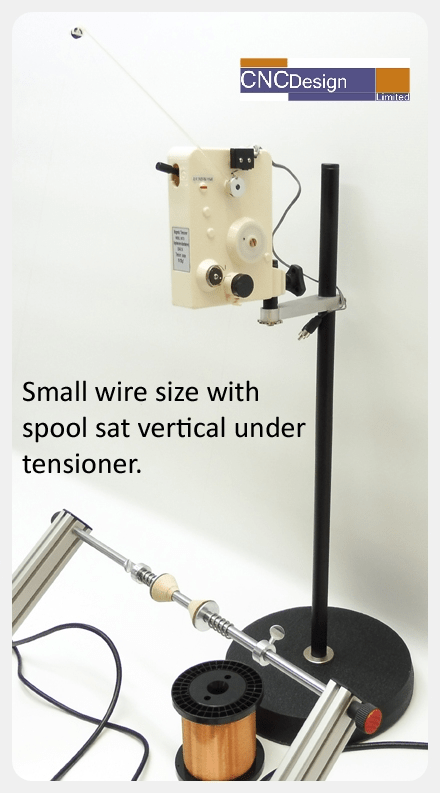 For smaller wires the spool of wire can be sat on it’s side and the wire will then be threaded over the top bar and into the back of the Feeder assembly. It will then go across a porcelain guide wheel, through a set of felt tensioners and through the ruby nozzle. In the picture the tensioner is mounted on it’s own stand and stands back from the machine. 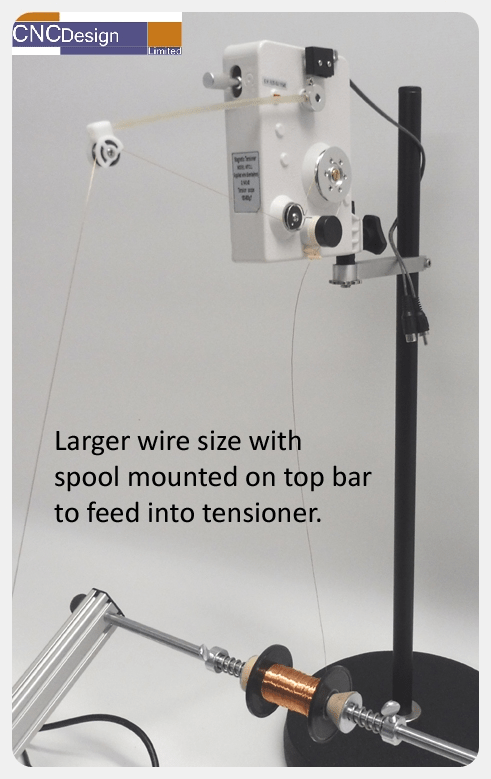 On both setups the wire comes off the spools that are mounted verticaly and thread up through the wire tensioner. The wire then enters the back of the feeder assembly and out through the ruby nozzle. On the second picture the ruby nozzle has yet to be fitted. 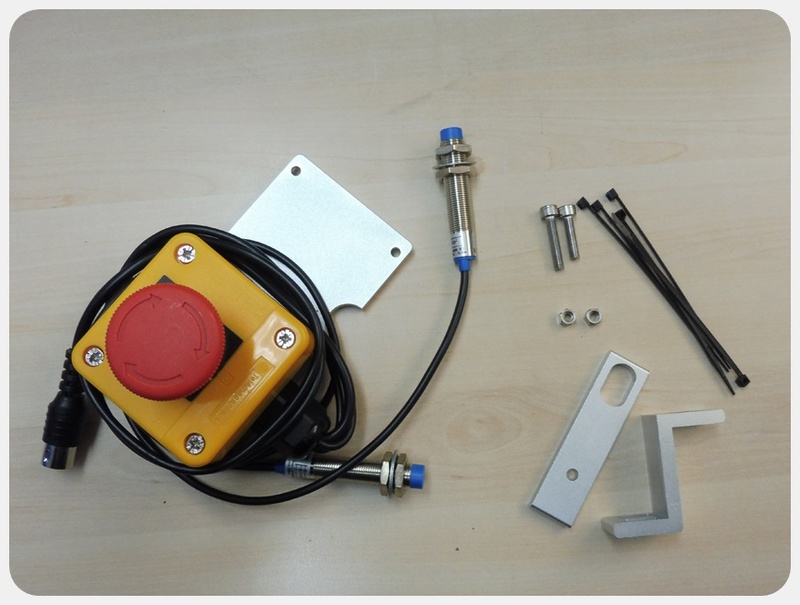 We are now stocking Magnetic Wire Tensioner Kits and they can be purchased on our Online Shop. 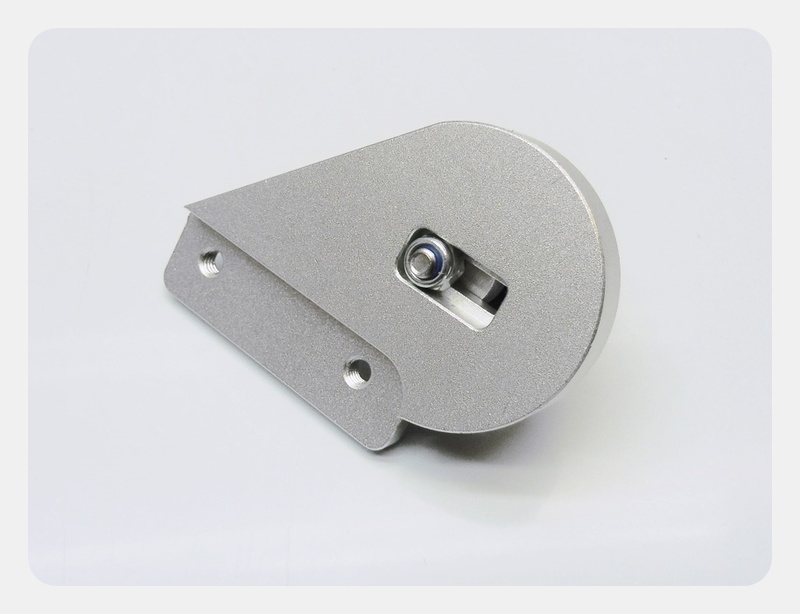 This addon replaces the rear ceramic wire guide with a porcelain wire guide pulley.This pulley is suitable for when using a tensioner especially with thicker wires that need a smoother path than the ceramic eyelets. 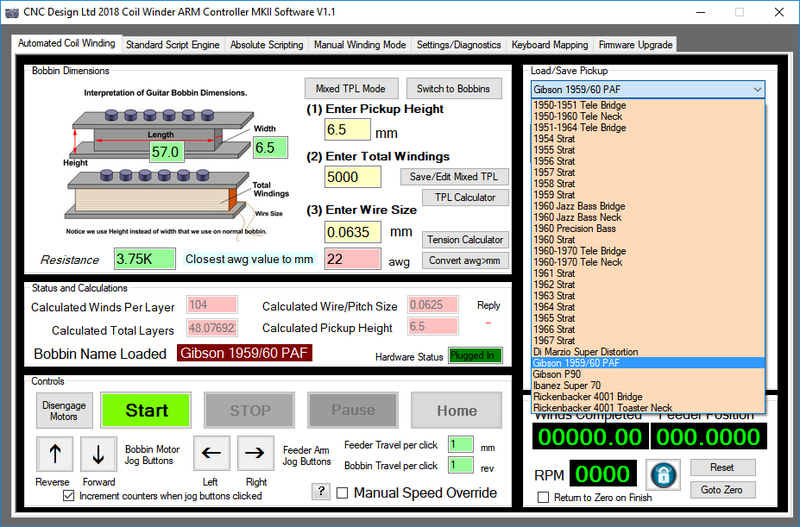 The 200mm Coil Winding Machine is controlled via the USB port of a PC running Windows, along with our custom software that is supplied FREE. As you can see it has a dedicated database and GUI for Guitar Pickups but no reason why you could not wind small normal coils with it using the Standard bobbin page. The software will calculate the nearest layer count based on the pitch you choose so you can see how close you are to the original. Playing with the software will probably make more sense than me trying to explain! Also the software comes with a populate button that will load the built in database with a default set of common guitar pickup bobbins. You can also save and remove your own custom bobbins. 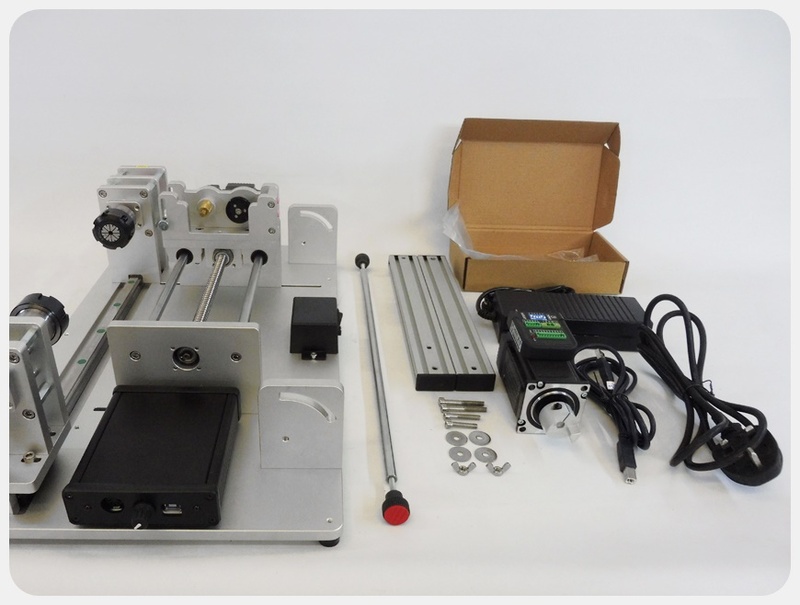 If you need a machine for larger wire sizes and more torque on the bobbin motor, then please feel free to contact us and we can quote on a custom made machine to suit your needs. Above screenshot is of the Manual mode. Here you can use the dial on the controller box and manually control the speed of the bobbin motor while guiding the wire by hand. 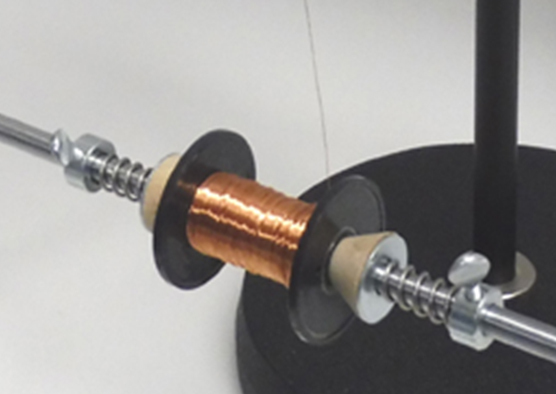 This allows the machine to be used as a traditional winding machine. 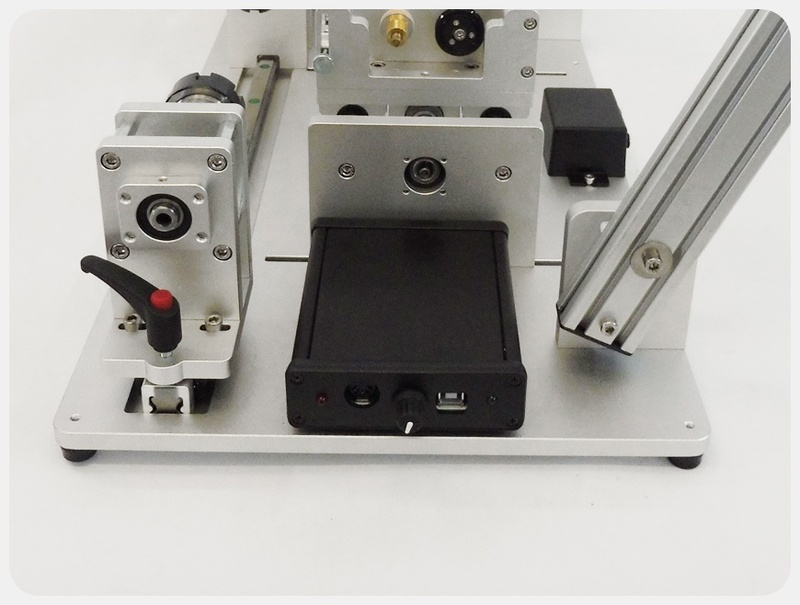 But also you can now manually control the speed of both the bobbin motor and the feeder motor by using the Automated Coil Winding tab controls. 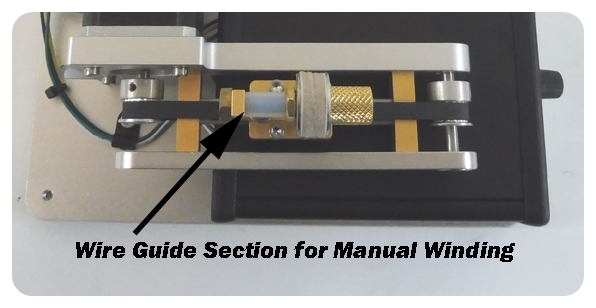 If using the Manual Controller from the Automated Coil Winding Tab then it is not recommended to run the machine full time with the manual speed controller. 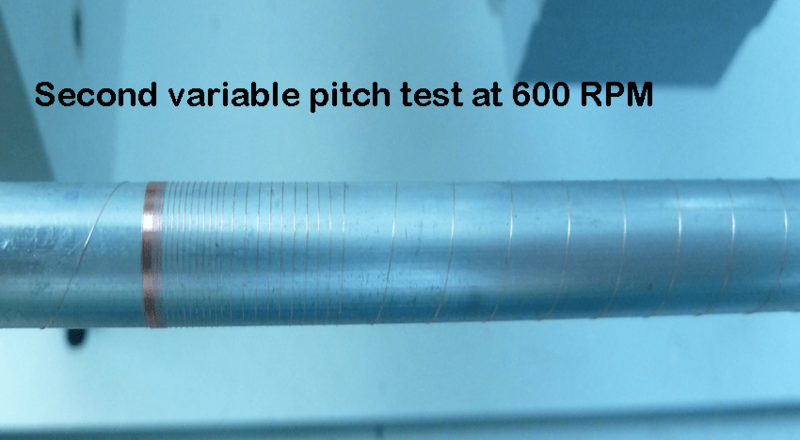 This is just to be used as a calibration tool, which will let you determine the best speed for winding the particular bobbin with wire you are using. Once you have found a speed that suits the bobbin and wire combination then you should switch to automatic mode for full winding. 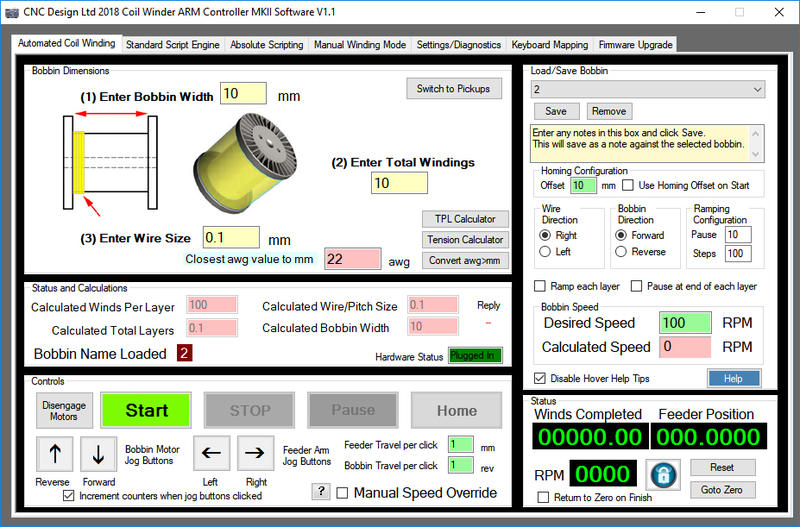 With the new software you can use features now that were only available on the 200mm Coil Winder. 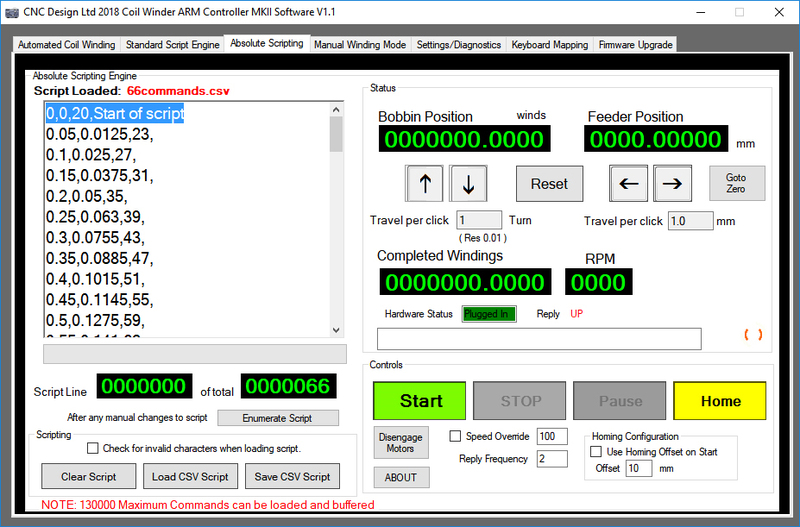 This includes the Incremental Script Engine and the Absolute Scripting Engine that will allow you to build up a list of commands to do a combination of fancy windings. 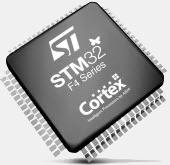 We have developed a new controller board that uses a fast Arm Cortex M4 processor and brings many enhanced features to the machine. 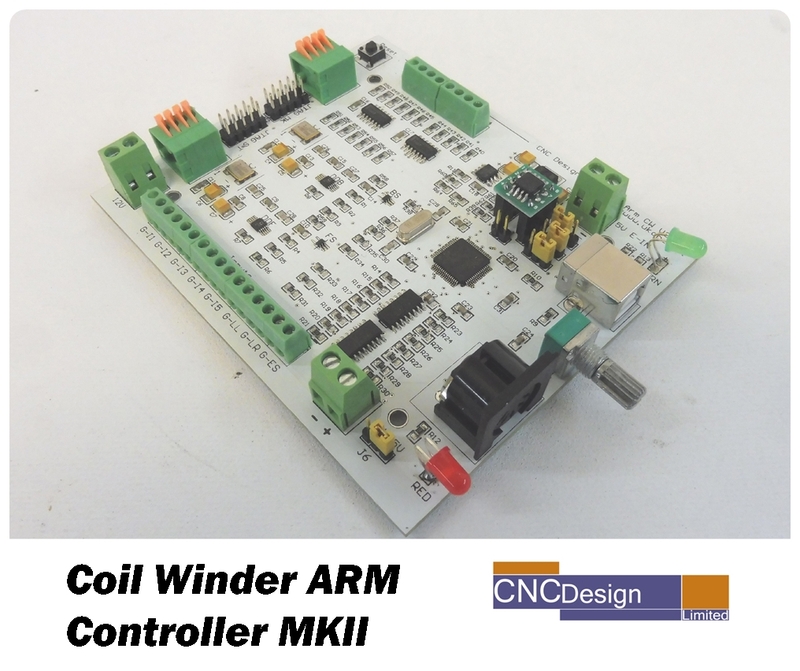 All machines despatched from January 2018 onwards will be supplied with the new Arm Controller MKII. Upgrade options are available for older machines. Please note that these new features are still in test mode and will be tweaked in software/firmware as they get tested and we get feedback. On board Flash memory that can be used to buffer upto 130000 commands. 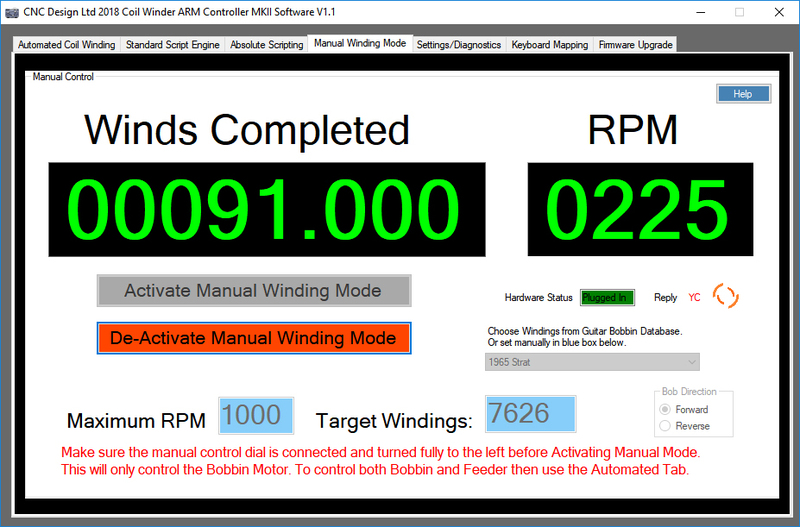 This allows for very small movements to be sent to the controller with no delay between them from the software's new Absolute Scripting Engine and build up some fancy windings. Jtag connectors for firmware upgrading. Wave winding a couple of coils from Jerry.He made up a special attachment that went in place of the nozzle. The attachment fed the wire in nice and close to the bobbin and applied a slight pressure down on the bobbin as it was wound. No bonding wire or glue was used and it self supported as it was wound. 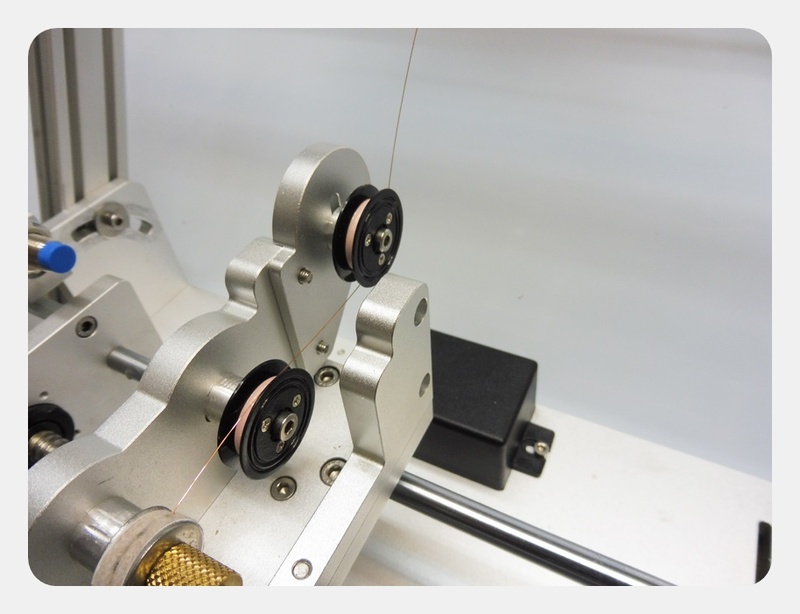 Because the new machine uses dual motors and a combination of our custom software/firmware, we can do perfect interpolation between each axis, which lays down the wire very precisely. 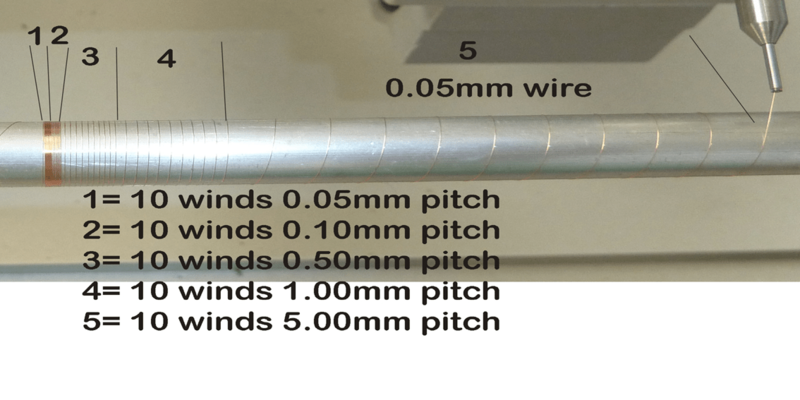 As you have full control of the Bobbin motor and Feeder motor down to degree level, you can perform some fancy windings and also do variable pitch as shown in the video below.